This morning, while returning home from an early morning birding at Bunche Beach, heard a very interesting story on the local fishing show on the radio. The host introduced Angie Chestnut, a local photgrapher, who had encounter with a very friendly Everglades Mink. Please visit her blog to learn more about this rare and endangered mink subspecies. Following work I headed over to Bunche Beach as I had not been there in a while and I knew that because the cold weather this morning it would not be very busy. I was a good decision as the tide was low and rising and we had lots of birds. The predominate species were a couple of hundred Black Skimmers. They are always enjoyable to watch. Found a couple of Common Loons and three Red-Breasted Mergansers. It won't be long and they'll be heading north. Not too many gulls. A few Ring-Billed Gulls and the Laughing Gulls were already molting into breeding plumage. Plenty of plovers were on hand including Piping, Semipalmated, Wilson's and Black-Bellied. There were Western, Spotted and Least sandpipers on hand as well. Only one Marbled Godwit and several Short-Billed Dowitchers. My targets of the day was to see if any red knots were around or if the long-billed curlew could be found. Well, not this morning. The Sanibel-Captiva Audubon were also on-hand with a large group for there bird walk. Elected to twitch after lifers today. My options were to head north to Sebastian Inlet for the harlequin duck or south after the reported smooth-billed ani at the Anhinga Trail at Royal Hammock in Everglades National Park and then a jump over to Key Biscayne to the LaSagre Flycatcher at Bill Baggs State Park. Even with rain, I chose to go south. The distance was shorter and a two-for-one was a possibility. Checked out the scissor-tailed flycatcher roost on Florida City on Sw314th were we found four camera shy birds. Then a quick stop at Lucky Hammock hoping for a few raptors and maybe warblers and such. Found several kestrels and northern harrier. The best bird here was a Brown-crested Flycatcher. It is a very rare wintering bird to south Florida. A smooth-billed ani had recently been located along the Anhinga Trail in the Everglades and appeared to be very dependable. Well, this species is one of my nemeses birds. It is a bird found in the West Indes and had become a common south Florida bird after its arrival here, on its own. But now it has become quite rare. A small population has been identified along Old Griffen Highway in Ft Lauderdale, near the airport. I have been there at least eight times to search out the anis, always without success. It seems to be a matter of luck. So an opportunity of a dependable bird was enticing. reports seemed to indicate it was easily found along the trail in the morning and was not very shy. See the link below for a photo of it. Well we looked for about four hours in a morning and afternoon session. A volunteer at the park commented that it seemed the bird came out late and she had a photo of the bird she had taken yesturday. She also commented on when the bird arrived it was the greeted by a great many of birders and cameras. Did get some good looks at several Purple Gallenules, and a great many wading birds. There were a few tree swallows, but did notice a single Purple Martin. Had a fly over of a White-Tailed Kite, and had to be a hundred Black Vutures hanging around and unafraid of all the people. Fact is most of the animal life here were people friendly. The Gumbo Limbo Trail was a bit birdy. Had the usual Blue-Gray Gnatcatchers, Cardinals, a couple of Black & White Wablers, a Black-Throated Green Warbler and a Louisania Waterthrush. Drove all the way down to Flamingo to look for the American Crocodiles, but it being a wet cloudy day, they were not sun bathing along the canal by the marina. Not much else was around either. A couple of Osprey and a few laughing Gulls. An American White Pelican could be seen out in the bay and several Brown Pelicans were resting in the mangroves. Because of the time wasted looking for the ani and the inclement weather, we blew off the trip over to Key Biscayne and headed for home. Did find a flock of about 40 Common Mynas in Homestead as we were gassing up the car. A few Red-Shouldered Hawk photos. On Tuesday, February 16th, visited Corkscrew Swamp Sanctuary, arriving about 10:45am and the place was packed. They expected a 800 visitor day. Extremely Crowded. I came to see if I could locate the reported Shiny Cowbirds at the feeders. Waited patiently at the butterfly garden feeder, but so many people came through the area that the cowbirds and grackles would only briefly come out. Did have a male Painted Bunting make an appearance. Took to the boardwalk and had a suprising number of hits considering the the crowds. Had six warblers including Black & White, Yellow-Throated, Common Yellowthroat, Palm, Yellow-Rumped and Northern Parula. Also had three vireos - White-eyed, Blue-Headed and a Yellow Throated. The Yellow-Throated Vireo was very unusual as it is kind of early yet for their arrival. Saw a couple of Red-Shouldered hawks, but missed on the Barred Owls. Had another male Painted Bunting at the Bunting House feeder, but did not see the resident ovenbird. The water was to deep for the wading birds, so only saw one Little Blue Egret and no nightherons. At the feeders at the end of the boardback finally succeed in locating a Shiny Cowbird among the many grackles and Brown-Headed Cowbirds. Also had six more Painted Buntings at the feeders as well . Cool!! Just read this account in the 'Illinois Birders' Forum entitled 'Golden Eagle attacks White-tailed Deer at Nachusa Grasslands!' by Eric Walters. Great story and photos. The January freeze here in southwest Florida was cause for a lot of damage to agriculture, and major fish kills. Even sharks and sea turtles died from cold shock. One victim, she was found around January 21st along the Sanibel River, may have been the grand, old crocodile that had lived on Sanibel Island for the past 30 years. She had lived in or about the Ding Darling National Wildlife Refuge and I had meet her there on one occasion. She was sun bathing close by the road and wildlife management had her cordoned-off and guarded. You were welcome to observe, but not to close. Most all American Crocodiles live in the Keys or around the Turkey-Point nuclear power plant in Dade County. So our croc was far removed from the rest of the population and was perhaps the mostly northerly residing crocodile. She had been removed a couple of times to place her in more friendly crocodile envirnments in the keys, were hopely she could successfully breed. But she always returned to Sanibel. Speculation is that the cold along with her advanced age was cause for her death. Many of our native species like loggerhead turtles and snook suffered big losses do to the unusual cold, but those exotics that had been gaining a foot-hold in Florida suffered as well. Tilapia, armoured catfish and other aquarium fish that had been gaining in population had massive kills. Burmese pythons and Iguanas also can not withstand the cold. This may have been the answer to the concerns about the pythons and other large tropical reptiles damaging the ecology of the Florida. I am curious if any of Cape Coral's Nile Monitors survived. An interesting story I read in the News-Press concerned many dogs in dade County becoming ill from eating on the corpses of dead iguanas. It seems that the corpses carried a botulism. Toward the end of January, rare bird reports were popping up of an Ivory Gull at West Point Dam, Georgia. Even Florida based message boards were carrying reports on the gull. This is a small, white gull of the Arctic north. It rarely is found so far south. A great opportunity to twitch on a bird that would normally be thousands of miles away. Reports quickly came in on birders jumping at the chance, but within a few short days the reports noted that the bird was either hurt or ill. Then the messages said not to bother making the long drive as the gull had been collected by wildlife management for treatment. I believe it was taken to Atlanta but it could not be saved. What a loss. It was such a beautifull bird. Test showed that it had pnuemonia. South Florida Water Management District (SFWMD) owns the Stormwater Treatment Area 5 (STA5), which is one of several huge properties used to filter surface water entering the Everglades. Hendry-Glades Audubon conducts monthly birding tours here on a reservation basis as SFWMD restricts access for safety and other concerns. And in February, during the Great Backyard Count weekend, STA5 is opened for three days, Saturday, Sunday and Monday. Last year I attended the Presidents' Day birding tour and had a good time. So I was anxious for a repeat visit. My daughter, Katie and I arrived shortly before the 8:30 start time which kicked-off with great views of Fulvous Whistling-Ducks, Black-necked Stilts and a Purple Gallinule. From this start we traveled by caravan atop the levees surrounding the various cells. In the course of the four hours we had hits on Black-bellied Whistling-Ducks, American Wigeon, a Eurasian Wigeon (a very good hit) and several other waterfowl, including thousands of American Coots. Most of the wading birds were represented including Wood Storks, Roseate Spoonbills, Limpkins and an American Bittern. Hundreds of American White Pelicans were present. We saw four Crested Caracara before reaching the property and had observed several Snail Kites on the tour. Most of the non-local birders enjoyed the snail kites as well as great close-up looks at active Black Skimmers. We had hundreds of Tree Swallows and found a lone Swamp Sparrow. 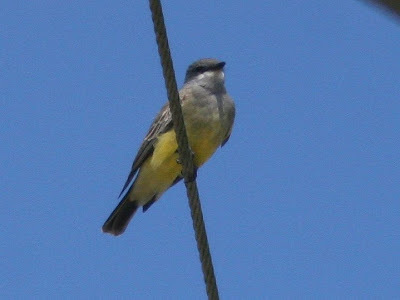 For me the best sighting was a lifer with sighting of a wintering resident Cassin's Kingbird ( rare to Florida ) in the company of a Western Kingbird. We also found several Purple Swamphens which are exotics that had begun to gain a threshold in the Everglades after several escaped captivity during Hurricane Andrew. Wildlife management had tried to eradicate the exploding population over several years and has finally given up as a lost cause and the swamphens will probably be expected as ABA countable soon. Another escaped exotic, the sacred ibis, had also recently began to breed in the wild, but looks like wildlife management had been more successful with eradication of this species. Did a little birding in the Alva area after work this morning. The weather was cold and windy today, but the rain was over. Found several Indigo Buntings at the feeders in town. Several are already molting into their deep blue plumage. A few American Goldfinches were present and three Painted Buntings as well. Several White-winged and Mourning Doves were working the ground under the feeders. Drove over Caloosahatce Regional Park, but only found a Common Yellowthroat and a Red-bellied Woodpecker. Found several American Kestrals on the wires and heard an Eastern Meadowlark too. My biggest surprise was a camel. In a pasture along North River Road between Alva and the park I noticed the camel right up next to the road. It shared the pasture with several horses and a black llama. Had to stop for a photo. Spent about two hours this morning birding Harns Marsh in Lehigh Acres. Harns Marsh is usually a dependable location for two of Florida's specialities, that being Snail Kites and Limpkins. Both feed on the apple snails found here. However, the unusual rains we have been experiencing lately have kept the water levels higher than normal at the marsh, which effects the numbers of snails available for the kites and limpkins. On past visits I had been able to count as many as ten kites working the marsh. Today I could only locate a lone female. Limpkins continued to be readily available though. The most prevalent species today were hundreds of Tree Swallows and American Coots. Tryed to see if any rough-wing swallows were mixed in with the tree swallows, but I could not managed that. But I did have my FOS Purple Martin. It won't be long till the swallow-tailed kites return as well. As for the waterfowl, we had hundreds of coots, a hand-full of Mottled Ducks, about six Lesser Scaups, about 5 Blue-winged Teal and a sole Hooded Merganser. Also found a mixed flock of warblers including Palm, Yellow-Rumped and Yellow-Throated Warblers, plus a Ruby Crowned Kinglet and several Blue-Gray Gnatcatchers. From here drove over to Alva to locate Red-headed Woodpeckers. Lately I have been trying to bird Six-Mile Cypress Slough very early on Sunday mornings. Its very quite and the parking area can be very birdy with warblers, vireos and woodpeckers. Last week I had good looks at Prairie Warblers and a Hairy Woodpecker, which gave me a total January count of 171 birds. I am also keen to locate the resident wintering Ruby-Crowned Kinglet, which can be usually be found around the parking area, but what I'd really like to relocate is the male Black-Throated Green Warbler that was also wintering here. It has often been observed in mixed flocks and often near to the Green House in the early morning. I had briefly seen it back along the boardwalk back in December and later heard it as well. But so far I have not been able to find it. I'd be interested in hearing from anyone who has recently sited the bird. Today I arrived about 8:00am to an empty parking area and found it not to be very birdy at all. Did find a couple of Yellow-Rumped Warblers and a Prairie Warble, but not much else. So I took a short walk out along the boardwalk. Still pretty quite. Did find a Black-Crowned and a Yellow-Crowned Nightheron though. The most interesting sighting was a pair of waterfowl I observed from the balcony of the Green House. They were torpedo-shaped and very rapid in their flight. They circled the area once and took off. My immediate thought was that they were a pair of Common Loon as one was a plain brown and the other, also, had a plain brown body and a dark head and neck. But that would mean that the male had already mottled into his breeding colors. Not totally sure, but my guess is that it is too early. So what I have decided on was we had a pair of Red-breasted Mergansers flyby. Later in the day I was surprised to find a squawking Monk Parakeet wiring-sitting in my backyard. He did not stay long, maybe because my feeder needs filled. This has been his second visit that I am aware of. Lesser Scaups are fairly common wintering in Southwest Florida, but we almost never find Greater Scaups here. Identification can be very difficult between the two species. However if you have an opportunity to bird in north Florida, you may have to try. The '10,000Bird' blog has an excellent page on comparing these birds. Try this hyperlink to their site - http://10000birds.com/lesser-scaups.htm/ - to learn more. Spent the night in Titusville, which is on the doorstep to Merritt Island national Wildlife Refuge as well as cape Canaveral. So was able to enter the refuge at 8:00am. My first good hit for the day was on the causeway with a couple of second winter Lesser Black-Backed Gulls. What had originally caught my eye with this group of gulls was a pair of adult black-backed gulls. Could be sure if they were greater or lesser black-backed gulls as they immediately flew off. Took the Black Point Wildlife Drive were many good hits were made including American Avocets, Roseate Spoonbills (only sighting all month of spoonbills), more American White Pelicans, Caspian Terns, Northern Pintails, American Widgeons, Blue-Winged Teal, Northern Shovelers, Bald Eagle and a Sora. Missed on the Eurasian Widgeon, but I did not hear about its presence till later and besides there were hundreds of ducks with many in bad light. At stop #8 was able to call up a sora.. On last years visit to the refuge a sora was called up by another birder’s recording at this spot. This is also an excellent habitat for other rails species, as well, which would have been nice to locate. As for calling up the sora, I remembered someone telling me once that a rail could be called up by a clap of your hands. So with nothing to lose I tried it and the sora began to chatter and made its appearance. Not sure if the clapping really worked, but I was finally able to get a picture of a sora. After completing Black Point I drove over to the Bio Lab Road, which parallels Mosquito Lagoon. Last year I was able to locate Florida Scrub Jays near to the Bio Lab Road, on cr406, but not today. They can often be found along the roadways in the scrub areas. The Bio Lab Road had Blue-Winged, American Coots, Mottled Ducks, most of the waders and several shore birds like Dunlins and Sanderlings. Found Forster’s Terns and another lifer in a Bonaparte’s Gull. Sadly a dead loggerhead turtle was seen close to the shore. I later reported the turtle at the visitors center. I was informed that the turtle probably died from cold stress from the resent two weeks of freezing weather we just experienced. Something like 2,500 cold-stressed sea turtles had been collected by wildlife management from around the state in an effort to try to save as many as possible, yet hundreds still did not make. Bonaparte's Gull - a poor photo but a lifer. Was preening on shore along Bio Lab Road, Merritt Island. Next and the last stop of the vacation was Viera Wetlands near Melbourne. The wetlands are a discharge ponds for a Brevard County wastewater plant and has become quit well known as a good birding location. Most utility plants are off-limits to the general public these days, especially since 9/11. But the Viera facility continues to welcome public access to the wetlands on a controlled basis. The big draw these days at Viera Wetlands is a wintering male Masked Duck. Very rare to Florida. This is a tropical species usually found in the Caribbean or Mexico on south. I was able to get a tick last year on a female that wintered on Alligator Lake near Lake City. Spent about an hour and a half here and was able to locate the duck by watching were the serious birders were gathering. Other good hits here were a Crested Caracara, a pair of Limpkins and two pair of Sandhill Cranes. Also present was Caspian Tern and several species of ducks including Hooded Mergansers. This stop concluded the birding vacation and was now time to head for home. Originally my plans included the panhandle to seek more rare and regional birds like a green-tailed towhee, lark sparrow and pacific loon at Ft Pickens, Florida Caverns State park for more northern birds like brown creeper, golden-crowned kinglets and winter wrens and St Marks NF for all the waterfowl and diving birds. Maybe next winter. On day four of my birding vacation I arrived about 8:00am at the LaChua Trail in Payne’s Prairie Preserve, south of Gainesville, Florida. Had earlier started my day with a Carolina Wren and a flock of American White Pelicans flying over the hotel parking in town, which I took as a good omen for the trip. We had lived in Gainesville back in the 80s when I was the cafeteria manager at the nearby Nationwide Insurance regional offices. At that time I was too busy with work and tending to my growing family for birding. In fact I was just starting up my interest in family history research which did eat up my spare time. So now I am back to check out a great birding site. Back in January 2009 was, in fact, my first visit to the LaChua Trail, which is very impressive. Had been attracted here by Florida Rare Bird Alerts to a Harris’s Sparrow, very rare in Florida, and of the presence of a pair of Whooping Cranes. On that visit I did score on the Harris’s Sparrow and on the Whooping Cranes. Both lifers. The whoopers were among several thousand Sandhill Cranes wintering on the prairie. 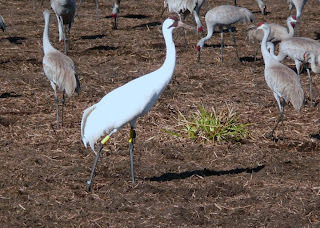 They were adorned with tags and telemetry, as they were a part of the flock of birds that wildlife management are trying to reestablish to Florida. This status negates their qualifying as ABA countable at this time, but I had to see them in the wild and they are now on my lists. Technically, I need to look for them in Texas on their wintering grounds or at the Platte River during migration. But I don’t live over there, I live here. A surprise last year was the arrival of a flock of Snow Geese. Very unusual in Florida. I witnessed their arrival and was able to get a photograph as they grazed among the cranes. 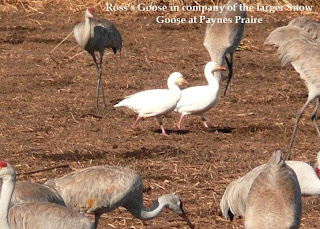 Several days later I noticed remarks on the Birdbrains message board about these same geese and that in fact one of them was a rarer Ross’s Goose. A review of my photos showed that I had a photo of the bird. Cool! Two new lifers. Plus I was able to see one of the resident bison, that lives on the prairie along with a herd of wild horses. This year was different. The thousands of cranes, including the whoopers were not on-hand this day. Did find about thirty Sandhill Cranes. Also counted well over a hundred large, some very large, alligators warming themselves in the sun along the trail on this chilly morning. Got five sparrows including Field, Chipping, Vesper, Savannah and White-Crowned Sparrows. Found four ducks including Mottled Ducks, Wood Ducks, Northern Shovelers and Blue-winged Teal. Other interesting sightings included Stilted Sandpipers, Merlin (supposed to be very unusual here), Northern Harrier, Eastern Towhee and an American Bittern. Plus a fly-over of Long-Billed Dowitchers. My list - Tundra Swan, Pied-billed Grebe, Merlin, Loggerhead Shrike, Eastern Meadowlark Bartram Farm, St John’s CountyNext was about an hours drive east toward St Augustine for a pair of juvenile Tundra Swans wintering on the Bartram Farm development along CR13A in St John’s County. This is an extremely southern location for this species and the initial observation reported that original flock was of twenty birds. For some reason these two elected to stay put, which is fine with me as I had been considering a trip to South Carolina to look for wintering swans. Should make the trip someday. Following the Florida Rare Bird Alert directions I drove right up the swans. They were standing on the shore of the lake right next to the roadway. Pretty cool!! Another lifer. My last stop for the day was at New Smyrna Beach at the Ponce Inlet in Volusia County. Arrived about 4:00pm, so I hurried along the boardwalk toward the rock jetty for my target. Ponce Inlet is about the most southerly location to reliably locate wintering Purple Sandpipers. I did find a pair of these birds here last year and in a recent email request about them with local Ponce Inlet birding expert, Michael Brothers, a reported recent survey found a pair on the Smyrna Jetty. They prefer rocky shorelines, or rocky jetties and are often in the company of ruddy turnstones. I attempted to walk along the boulders making up the jetty, but my shoes were too slick for the slippery rock. About had a serious spill, much for the entertainment for the locals. I did get my tick on the Purple Sandpiper, but it was too far out for my camera. So I’ve include a shot from last year. As I was heading out the Northern Gannets arrived at the inlet and were actively feeding. Cool! !.